Thou didst establish the earth, and it stands. For by them Thou hast revived me. I shall diligently consider Thy testimonies. 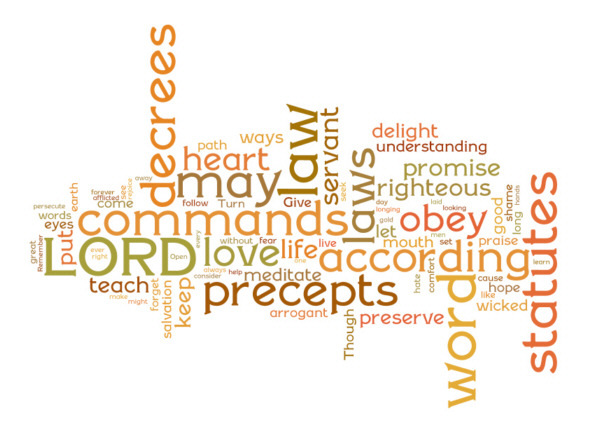 Thy commandment is exceedingly broad. Over 22 days (with a few Sabbath rests in the midst) it is my hope to soak in and meditate on Psalm 119. This is the longest chapter of the Bible with 22 sections. Each of the 22 sections is an acrostic in the original Hebrew language that alliterates each statement with one letter from the Hebrew Alphabet. In reading through this Psalm, one can find the meditations of the heart, the movements of the hands, & the all surpassing Grace of God. How long is forever? It is infinite. Until the end of time and beyond. When God speaks a word it is always truth and it stands forever. It is settled as a foundation and pillar, but it is also a catalyst that changes things forever. At the word of the Lord light was made. At the word of the Lord, life was established on the earth (which He also created at His very utterance of His word). At the word of the LORD there is a place of perfect tranquility and trembling because of His faithful truth and because of His unyielding mission. According to Isaiah 55, the Word of the Lord accomplishes much… in fact the truth of God’s word is that it will accomplish just what God has purposed it to accomplish. His word is perfect in it’s holiness, declaration, and power. This is what the psalmist declares in Lamedh (pronounced la-med) that God’s word is everlasting and perfect. Do we understand how marvelous this is? How wonderful it is that what God has said, and will say, through His word is perfect and forever. It echoes over us and rushes through us…and all of creation is never the same. In fact, all of eternity is never the same.